But, before we go any further, allow us to give you a brief history of Mount & Blade multiplayer. Our previous title, Mount & Blade: Warband, was the first game in the series to feature multiplayer. This was a highly requested feature from fans of the original Mount & Blade, and something that we thought would go hand-in-hand with our skill-based directional combat system. We launched Warband with a multiplayer Beta that allowed players to jump in and test their Mount & Blade skills against players from all over the world. Our community really ran with this: clans were formed, scrims were organised, and eventually, tournaments started to take place (and still are!). Flash forward 7 years, and we were finally able to show our recognition to this amazing part of our community by hosting our own LAN event, The Battle of Bucharest, with the best individuals and teams in the scene being invited to participate. With Bannerlord’s multiplayer, we want to build upon this strong foundation and offer a deeply engaging multiplayer experience that is easy to pick up, yet offers great depth and variety. To this end, we are working on a number of multiplayer modes. Skirmish is a 6 vs 6, player versus player (PvP) game mode. There are no bots to rely on, just your individual combat skill, and that of your fellow teammates. And while tactical prowess and strategy play a huge part in achieving victory over your opponents, solid teamwork and good communication are key to success. The solution we found was to have a game mode with limited spawns, where the number of spawns you can have depends on the quality of your class choices. To facilitate this, we introduced a points system. Players start with a set amount of points that they can spend to select a class for each spawn during a round. Higher tier troops with better equipment cost much more, which limits the number of times they can be selected by a single player each round, whereas low tier troops are much cheaper, giving players the option of an additional one or two spawns for that round. At the end of the round, if you have unspent points, a limited amount of these can be carried over to the next round, which in turn opens up more tactical options for teams. Another concern was introducing tactical depth while maintaining a fast-paced game. To this end, we decided to adapt the system we had developed for Captain Mode, where players battle for control of up to three capture spots on the map. These capture spots act as focal points for action and are also tied in with a morale system that encourages teams to be active at all times. Each capture spot holds a flag that can be captured and controlled by one team. The morale of the team holding fewer flags will steadily decay, and if it depletes entirely, the team will lose that round. Throughout the course of the battle, two of the flags are removed (there is actually a mechanic which determines which flags are removed, and this can be gamed by savvy teams!) forcing the action at the climax of the battle to a single location. This mechanic, together with limited spawns, creates an engaging and tense multiplayer experience. Teams that are overly defensive are punished by the morale system and enter the last phase of the round with a significant disadvantage, whereas teams that are too aggressive may suffer early casualties from which they may never recover. Each of the maps featured in Skirmish has been made specifically for this game mode and with a set number of players in mind. Spawn points, flags, and the paths between them are all measured and placed in a way that ensures players can navigate the map with ease and jump into the action quickly. Likewise, careful placement of obstacles in the maps ensures that no single class is dominant in all situations, which encourages team diversity and an evolving strategy. 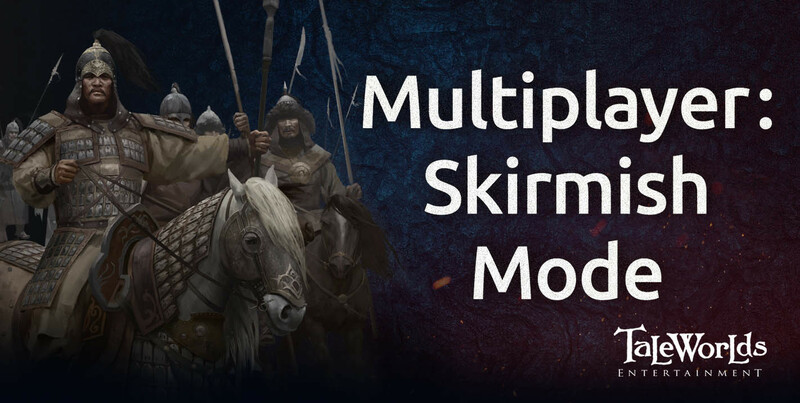 Of course Skirmish mode, like other multiplayer modes, is still under development and there is still a lot of work needed to fine tune and balance everything. To do this more efficiently, we are planning to carry out a closed multiplayer beta where we hope to get help and feedback from members of our community. We realise that this overview of Skirmish has probably raised a lot of questions about multiplayer in general, especially for Warband veterans. However, fear not! We will discuss much more about multiplayer in future blogs, including Bannerlord’s new class system, matchmaking, additional game modes, and, of course, details about the upcoming closed beta! Coop campaign !Coop campaign !Coop campaign !Coop campaign !Coop campaign !Coop campaign !Coop campaign !Coop campaign !Coop campaign !Coop campaign !Coop campaign !Coop campaign !Coop campaign !Coop campaign !Coop campaign !Coop campaign !Coop campaign !Coop campaign !Coop campaign !Coop campaign !Coop campaign !Coop campaign ! But perhaps most importantly I'd definitely write a blog about how outdated your engine is and how low res the textures look ingame. A co-op campaign would be really great! Co-Op Campaigns are a really dumb idea for 2 reasons. Not only that, but battle will become really weird. as in "Oh god I have to avoid that battle or I lose 3 days worth of time" weird.